Es gibt eine frische Crowdfunding Kurzübersicht #81 (Zeitraum: 19.07 bis 29.07). Nachdem ich gerade in den Reisevorbereitungen für die GenCon bin, möchte ich mich diesmal im Vorwort sehr kurz halten. Hinsichtlich der deutschsprachigen Projekte finanziert Ulisses Spiele aktuell Torg – diesmal auf Deutsch. Unter den englischsprachigen sticht The Expanse als populäre IP hervor. Die Erde wird von finsteren Parallelwelten bedroht, die in unsere Realitäten eindringen und sie zu überlagern Versuchen. Nun ist es in diesem cinematischen Rollenspiel an den heroischen Storm Knights die Invasion zu stoppen. A horror tabletop rpg where your worst fears are brought to life. Will you be overtaken by your phobia, or finally defeat it? Power Outage is a kid-friendly, kid-focused Superhero roleplaying game, that focuses on accessibility, learning, teamwork, and fun! Necrotopia is a pen and paper role-playing game. We are releasing a complete 30 page color rule-set book with original artwork. #RPG. Expanding Universal Horizons ~ Adding more modern fantasy! We are indie gamers and designers expanding a universal, multi-genre, skill-based, tabletop role-playing game (rpg) with new genres. Help us bring back Steve Jackson’s first tabletop RPG. Metal, Magic and Lore Fantasy RPG – Revised Edition! In the golden age of tabletop role playing design, we introduce the newest evolution of Metal, Magic, and Lore: the Revised Edition. The Sons have decimated the Warfront Starlight and declared the Alliance Rogue. Strike from the shadows and take back the Warfront. A science fiction tabletop game, unique aliens, new religious beliefs, badass plasma swords and most importantly, adventure. New demi-human subraces, new equipment, spells, character paths and archetypes, a new type of magic, and more! 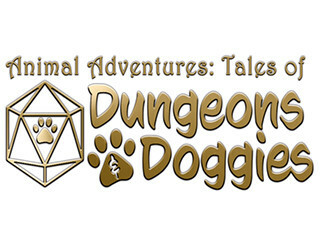 A range of highly detailed dogs compatible with role-playing systems. A 5E Campaign for Levels 1 to 12+ based on the conflict between a Halfling City State and the Courts of the Fey. Big DICE are really big, and sturdy, and can be used to play. Cthulhu and Undead themed metal gaming coins! Dragon Scales Wave 3 seeks reanimation. Do you have the magic? Copper, silver and gold gaming coins for LARP, tabletop and other games. A range of accessories to allow DM’s to hand out physical loot to players and enhance gameplay. Bags of gems, coins & treasure chests. Make dice rolls without the dice ever leaving your hand. Simply push, shake then release. Audio in a medieval inn to bring your tabletop roleplaying games and adventures to life. With a full music set by travelling musicians. is an amazing collection of over 40 stunning maps for use in your Cosplay, LARP or TTRPG role-playing games! Relaunching 5th Edition journals to organize a full campaign of session prep/world-building, and facilitate play and note taking. Are two colors better than one? New Magnetic Status Markers for Dungeons & Dragons, Pathfinder, Savage Worlds, and other tabletop RPG! A Co-Op Roleplaying dice game for 1-5 Heroes who dare to face the most terrifying Dragons in Aqedia. Le jeu de rôle policier culte dans un monde meurtri est de retour, 25 ans après. Un juego de rol sobre artes marciales y fantasía épica asiática.